Favorite activity: Cuddling with Mom, then walkies. I love to walk and hold my head up proudly and just prance right along. Special talents: Ah well, just being me, the most adorable Westie ever! Most embarrassing moment: None, I the perfect Westie. Most trouble I ever got into: Not here either. I have only been with Mom since May. I am an angel. 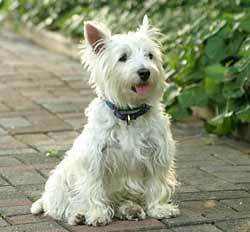 My favorite friends: Kayla (Cairn), HP (cat) and of course Mom!! Biggest adventure: Coming into foster care and getting to stay with my foster Mom. She's now my forever Mom.